Portland auto accidents can cause serious, and sometimes fatal, injuries to drivers, passengers, bicyclists, pedestrians and other road users. Traffic fatalities have been on the rise across the United States in recent years. Here in Oregon, this upsurge has mirrored national trends to a large extent, and road authorities have used data to better understand the causes of fatal traffic accidents. This allows them to develop effective safety strategies, which help Oregon reach realistic goals for reducing traffic accident deaths. The National Safety Council reported that 2017 saw a slight (1 percent) drop in auto accident fatalities across the United States. However, this is not evidence of safer vehicles or drivers. Rather, it appears to be a statistical effect of drastic increases in recent annual fatality rates. In fact, auto accident fatalities in the United States have increased 6 percent between 2015 and 2017. This was the highest two-year gain in more than 50 years. Here in Oregon, fatality rates have also been on the rise. The Oregon Department of Transportation reports rising road deaths began in October 2014. By 2015, Oregon’s traffic fatality rate per vehicle-miles traveled was higher than the national average. This is bad news for a state that had been consistently below the national average since 1999. The DOT therefore set aggressive goals for reducing the fatality rates per vehicle-mile traveled in Oregon. It is also helpful to understand the most common factors that lead to fatal traffic accidents in Oregon. The Oregon DOT reports that alcohol, speeding, and lack of seat belt use are the leading culprits. Luckily, these problems are preventable. Drivers can reduce their personal risk of sustaining fatal injuries by addressing these risks in their own personal driving habits. While other drivers’ behavior cannot be controlled, you can reduce your risk of fatal injuries on the road by reducing your speed and always wearing a seat belt. Weather can also be a contributing factor in Oregon car accidents. KGW8 reports on a fatal multi-vehicle accident on Interstate 84. Black ice and high speeds caused an initial collision which resulted in a domino effect of accidents. Ultimately, 20 vehicles were involved in the crash, nine victims were injured, five were left in critical condition, and one victim died. This accident is a stark reminder of the dangers posed by weather conditions on the roadway. Oregon is known for experiencing generally mild winters, which gives some drivers a false sense of security. The fact is that rain, sleet, ice, and snow do occur in Oregon. When they do, slick roadways pose additional dangers to motorists, especially those who aren’t prepared for the risk. 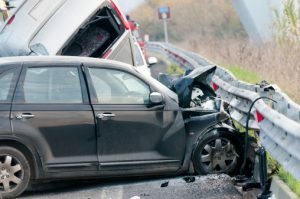 Our auto accident attorneys know how devastating an auto accident can be. We fight hard to hold negligent drivers accountable for dangerous conduct in order to make the roads of Portland safer for everyone. But it is equally important for drivers to accept personal responsibility for their own safety and that of others on the roadway. When an accident does happen, an attorney can help protect your rights and fight for the compensation you deserve. This entry was posted on Thursday, April 5th, 2018 at 5:35 pm and is filed under Car Accidents. You can follow any responses to this entry through the RSS 2.0 feed. You can leave a response, or trackback from your own site.